Landmark International Trucks is a fleet resource, not a vendor! Home » Advertising » Landmark International Trucks is a fleet resource, not a vendor! I am so use to companies in all types of industries simply taking orders from their customers and not really offering any value or knowledge. I realize, in some situations, this is all that is needed and what the customer wants but there are plenty of others where the customer would benefit from so much more. I find this to be very true in the fleet graphics world. Orders are taken and transactions are made but customers are rarely challenged or educated. The vendor doesn’t want to “rock the boat” or complicate the sale. They are content with the customer doing the “same old, same old” because it’s what they have always done and a part of what got them to where they are today. Sometimes you get a pleasant surprise! A few months ago, I get a call from Landmark International Trucks in Knoxville, TN. The gentleman on the line is inquiring about our fleet graphic capabilities and services for a customer of his. After going over all of the options, he tells me the Advertising Trucks Traxx billboard system is exactly what he had in mind for his customer. 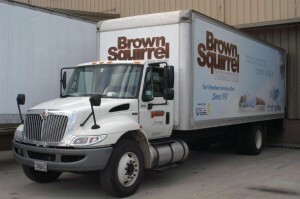 They are a family owned furniture store with a fleet of box trucks they use for deliveries. They have been searching for a new way to reach their current and prospective customers that is both cost-effective and impactful. Landmark recognized that there would be nothing better than their own network of rent FREE billboards that are constantly in the places they want to be. Why is this story significant, you may ask?? It’s really very simple – Landmark International Trucks went above and beyond for their customer. The customer had a need and they did the research and work to meet it. They challenged the “norm” and opened their customers’ eyes to a new and better way to use their fleet. They didn’t take the easy road or path of least resistence. They brought a new idea to the table and did what was in the best interest of their customer – even if it was more work on their end. Now, the customer is utilizing the world’s number one quick change truck framing system (the Advertising Trucks Traxx system) and Landmark International Trucks has a customer for life. Landmark International Trucks is a fleet resource, not a vendor and I look forward to working with them much more in the future.